This was my 2nd time with Justine and Giles, which I think speaks volumes for how good a retreat it is. You are looked after right from your arrival at the airport which I like as it takes any stress away from getting to the retreat. The facility is great and you are up in the peaceful mountains with beautiful scenery and lovely river beaches. You have your own room which is a necessity on retreat. The yoga was fantastic, very thorough with many helpful tips on how to introduce yoga into your everyday busy lives. There’s no judgement here on the mats, no crazy shapes just a deep understanding of the body and how yoga can help you physically, mentally and emotionally. The food was fantastic very delicious and nutritious, you didn’t want for anything you were very well taken care of. It was super fun, educational, relaxing and chilled and I highly recommend this retreat to everyone. I’ll be back. Beautiful setting and peaceful retreat with a lovely group of women. I found the yoga challenging as I’m not very flexible but Justine showed me variations and the use of aids to which meant I was still able to get into the poses. After day 3 the hip pain that has been a constant feature due to the amount of sitting at a computer- disappeared! I have since introduced a yoga practice into my daily life using the things I learnt on retreat. My hips remain pain free. It works! 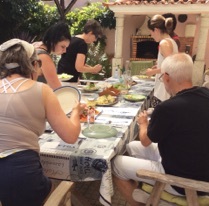 Aside from the yoga – Giles and Justine were wonderful hosts and created the most wonderful food each day. No hesitation in recommending this retreat. Thank you for a fantastic week! I thoroughly enjoyed it. I liked the routine you had worked out with the meal times and yoga sessions, with free time in the afternoon. The villa was lovely, and the grounds added to it being very relaxing. It is a lovely unspoilt area. I’m missing the walks to and from the studio already! And thank you to Giles for looking after us all so well, too. What a lovely week of benefitting from amazing yoga, beautiful scenery and delicious food. There are definitely insights and yoga sequences I will incorporate into my daily life. Justine had really thought of everything in making us feel welcome and think about self-care which is so important with the frenetic lifestyles we lead. I would highly recommend a yoga retreat in this part of Portugal which has some stunning scenery. A wonderful, educational and well structured retreat. Quality yoga, good company and delicious food. A retreat to rejuvenate and deepen your practice in a loving and supportive atmosphere. Many thanks to Justine and the sweetyoga crew. Looking forward to the next one! Thank you Justine for your warm, gentle and attentive approach to yoga. I had a lovely holiday with you. I wanted to spend some time with myself and this was the perfect holiday to do plus I made some new friends. In my mind I keep going back to Portugal. I see the mountains and feel the sun and a calm and safe feeling fills me up. So thank you for the retreat Justine! Sweetyoga is the best yoga retreat I’ve been on. 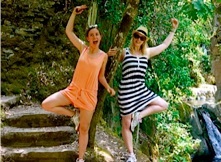 It is fabulous value for money with two yoga sessions per day in a well rounded, well organised and individually tailored course which focuses on applying practice to everyday life. Justine’s generosity and attention are second to none. The chaperoned transfers meant we could switch off and enjoy being looked after. A true indulgence! Having the stress/responsibility of the transfer taken out of my hands was exactly what I wanted. I enjoyed the veggie menu, it was nice to try a different diet for a week and the picnic was superb, round of applause to you for that and the snacks you left us (I ate a fair few of those..!) I hadn’t experienced restorative yoga before but I deffo felt the benefits, you instruct your vinyasa classes well and I felt I was given attention as an individual to a high degree even in a group session. I will deffo sow the seeds for another visit to you next year.